The Orange juices Sanpellegrino have a prestigious tradition, which it goes up again in 1932, year of foundation of the historical factory of Messina. The Orange juices Sanpellegrino are produced exclusively by true oranges of Sicily, and this has always made products it a quality synonym, before becoming a status symbol exported in the whole world to the sign of the Italian style. Rigorous standard Sanpellegrino guarantees the quality of this exceptional product with further 150 daily controls, the preparation of the juice until the final bottling. Three different tastes, the Classic Orange juice, the Orange Amara, the Sweet Orange juice, have been born to satisfy any type of thirst, all characterised by a single distinctive stroke: the presence of the unmistakable orange pulp as a token of the genuineness of the product. Aranciata Amara 24 can x 330 ml. 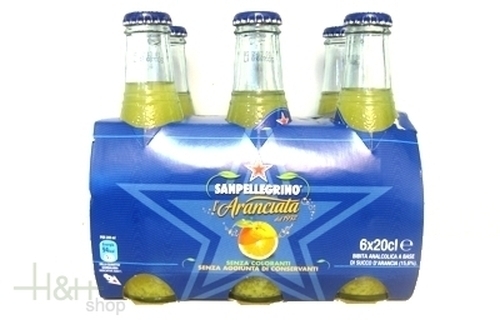 - Sanpellegrino 21,05 EUR / 2,66 €/lt. Tyrol Tonic Water 3 x 250 ml. - Drinkfabrik 5,95 EUR / 7,93 €/lt.